Evgeni Malkin had a goal and three assists, while Guentzel scored two goals in the second period and added an empty-netter to wrap up his second hat trick of the season in a wild opener to Pittsburgh’s five-game West Coast road trip. Jakob Silfverberg scored a go-ahead, short-handed goal late in the second period, but the Ducks haven’t won since Dec. 17 at Pittsburgh, going 0-7-3. Guentzel scored twice and Malkin got another as the Penguins erased Anaheim’s 3-0 lead in an 11-minute span of the second period. Pittsburgh then trailed 4-3 midway through the third before Pearson and Kessel scored 48 seconds apart. 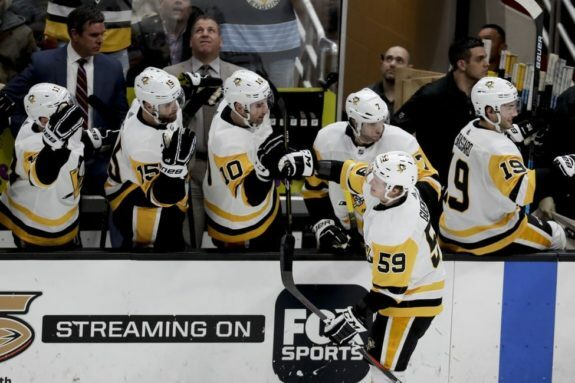 Kessel put the Pens ahead by taking the puck away from Jacob Larsson and shrugging off the defenceman’s checks to score on his own rebound. Both of these longtime playoff contenders got off to slow starts this season, but only Pittsburgh has managed to maintain its recovery. Anaheim’s slump shows no signs of abating as it wrapped up an 0-3-3 homestand. Anaheim led 3-0 late in the first period on a goal by Sprong, who was traded from Pittsburgh to Anaheim last month in a deal for defenceman Marcus Pettersson. Sprong has six goals in his first 5 1/2 weeks with the Ducks, flashing the potential that the 21-year-old Dutchman never reached often enough for the club that drafted him in the second round in 2015. The Penguins rallied with a ferocious second period, tying it with Guentzel’s second goal of the period on a power play. Guentzel recorded his fourth multi-goal game of the year and secured his second career 20-goal season, closing in on his career-high 22 from last season. Silfverberg reclaimed the lead for Anaheim with a short-handed breakaway goal after Adam Henrique forced a turnover by Malkin at mid-ice, but Pearson evened it again with 10:27 left. NOTES: Pittsburgh scratched Patric Hornqvist, who incurred a concussion in Tuesday’s win over Florida. The high-scoring forward hasn’t been placed on injured reserve. … The Pens also scratched D Juuso Riikola and dressed D Jamie Oleksiak. … Anaheim scratched forward Pontus Aberg for the second straight game. He was tied for the team lead with 11 goals, but hasn’t scored in his last seven appearances.